Three webinars were held in conjunction with BatsLIVE! View them here. Below are the PowerPoint Presentations used in the webinar and available for your use. CLICK HERE for the caves and karst PPT as a .pptx file. CLICK HERE for the caves and karst PPT as a .ppt compressed file. CLICK HERE for the caves and karst PPT as a .pdf file. A video showing a model of groundwater is included as part of the PPT and is available if you CLICK HERE. Below is the PowerPoint Presentation about the types of caves. You are welcome to freely use the images from this presentation in school projects or presentations, whether printed or projected, without requesting permission, so long as they are not used in any media being sold or made for profit. For such use, contact the presenter. CLICK HERE for the PPT about the types of caves as a .pptx file. CLICK HERE for the PPT about the types of caves as a .ppt file. CLICK HERE for the PPT about the types of caves as a .pdf file. Below is a PowerPoint Presentation about life in caves. You are welcome to use the images in this presentation in schools or other educational venues. The photos are the ownership of many individuals and should not be used outside of this presentation without request written permission. For such use, contact Cindy Sandeno at cmsandeno@fs.fed.us. These images should never be used or released for commercial use (for profit). CLICK HERE for the PPT about life in caves as a .ppt file. CLICK HERE for the PPT about live in caves as a .pdf file. CLICK HERE for a short video about the unique characteristics of species that live in caves. Cave environments, by their very nature, provide a unique system, which is highly valuable for scientific study and environmental education. Due to the extreme isolation and harsh conditions of the cave environment, caves provide habitat for an array of unusual and rare animal species, including species that are at risk of becoming extinct! Caves are portals to a unique environment and an intriguing web of life - where the forest gives way to the darkness of a cave, scientists have found some of the most remarkable creatures in the world. Within the depths of caves we can also find the remains of ancient life including some of the largest mammals to ever walk the planet such as saber toothed cats, short-faced bears, and giant ground sloths. Because caves are connected to the surface, we cannot protect them without protecting the lands that contribute water to them. Join us to learn about karst topography and the many special features including springs, sinkholes, underground rivers, and of course, caves that make up this landform. In a karst landscape, water moves very quickly through underground channels with little filtration, making it vulnerable to contamination. Globally, more than one billion people depend on karst terrains for their water supplies. Cynthia Sandeno is the National Cave and Karst Coordinator for the USDA Forest Service. She began her career as a wildlife biologist in Indiana and her interest in bats led her underground. 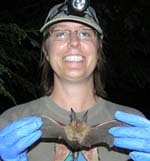 Cindy has participated in mist netting bats and performing hibernacula surveys in Indiana, Ohio, West Virginia, Arizona, and New Mexico. Cindy has developed many partnerships to help conserve and protect cave resources. She is also passionate about sharing the wonder of caves with others. Carol Zokaites is the Chief of Environmental Education for Virginia State Parks in the Va. Dept. of Conservation and Recreation (DCR). She is also the National Coordinator for Project Underground, a national karst education program. Carol’s combined passions for caves and science education has led to 16 years of teaching about groundwater and the unique habitats found in karst terrain. She has developed the statewide karst education program in Virginia, surveyed miles of cave passage, participated in bat hibernacula surveys and is on the WNS Communications committee. Dr. Rick Toomey is the director of the Mammoth Cave International Center for Science and Learning. The Center is a cooperativ e project of Western Kentucky University and Mammoth Cave National Park. In this position he works to promote research at the park and to improve public understanding of the cave and park. Rick has been studying Mammoth Cave and its historic uses for approximately 10 years. His work has included using fossils found in the cave to understand how people have modified the cave over the past 200 years. CLICK HERE to watch the "Bat Basics" webinar held on April 18, 2012. CLICK HERE for a pdf file of the chat during the webinar. CLICK HERE for a Word document of the chat during the webinar. Learn about bats, threats to bats, and how to help these beneficial creatures. As primary predators of night-flying insects, bats consume enormous quantities of agricultural pests and reduce the need for chemical pesticides. Yet these wonderfully diverse mammals are among the least studied and most misunderstood of animals. Bats are threatened worldwide, and their colonies and habitats are destroyed because of myths, misinformation, and lack of scientific knowledge and understanding. Bat populations are declining almost everywhere in North America especially due to the devastating White-Nose Syndrome. Losing bats has far-reaching consequences for natural ecosystems and human economies. Knowledge is the key to their conservation and protection. Join us to learn more about these fascinating, secretive mammals! 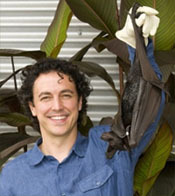 James Eggers is Director of Education for Bat Conservation International. He has taught elementary and middle school grades and been a biology and science education instructor at Texas A&M University. winter hibernacula surveys in Tennessee, Kentucky, Missouri and New York. Apple Snider is a wildlife biologist with the USDA Forest Service in Steamboat Springs, Colorado. She holds a bachelor's degree in environmental studies from Middlebury College, a master's degree in ecology from Colorado State University, and has worked with bats and other wildlife for over 15 years. Apple's passion for bat ecology and conservation has led her to work as an animal care and education specialist for the Organization for Bat Conservation in Michigan and on bat-related field research projects in Colorado, New Mexico, New York, and Panama. CLICK HERE to watch the webinar held on May 3, 2012. CLICK HERE for the PowerPoint Presentation given by Dennis Krusac, a USDA Forest Service endangered species specialist. This webinar will present activities, resources, and lesson plans to help you teach about bats in your class and in the field. Learn how to put together a bat education trunk, how to take students and adults on a bat walk, how to build and erect a bat house and more. Rob Mies, TV personality, conservation biologist, Founder and Executive Director of the Organization for Bat Conservation and author, has appeared on many television shows including the Tonight Show, Ellen Degeneres Show, Today Show, Live with Regis and Kelly, Late Night with Conan O’Brien, and Martha Stewart. Rob co-authored the book, “Stokes Beginners Guide to Bats.” His research includes work with the endangered Indiana Bat of the United States, endangered Rodrigues Fruit Bat in the Indian Ocean, and the threatened Spectacled Flying Fox Bat in Australia. Dennis Krusac is endangered species specialist with the USDA Forest Service. He has received many honors for his work with bats and in engaging students and visitors in Forest Service activities, while working closely with a variety of private-sector partners.